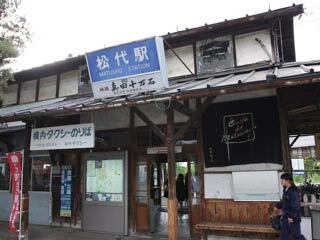 Matsushiro (松代) is located in Nagano Prefecture. Matsushiro was used to be a land of Sanada clan. The first Daimyo of Matsushiro was Sanada Nobuyuki, the brother of Sanada Yukimura. There are many Samurai houses and buildings still remains since Edo Period, such as Castle and Samurai School. Matsushiro is also the located where the famous battle of Kawanakajima was happened. Those ruins also remain at Matsushiro. All great spots are located around the Sanada's House. 1. use local bus to Matsushiro. Kaizu Castle: also known as Matsushiro Castle. In 1560, it appears in the history at first time. It was used for the great battle of Kawanakajima during the Sengoku Period. After that, Sanada Nobuyuki built better castle for Matsushiro in 1622. Samurai School: Matsushiro Samurai School (松代藩文武学 校) was built in 1853 by Sanada Yukinori. It is the only remaining Samurai School which has complete sets of all kinds of training facilities. Samurai of Matsushiro used to study not only all martial arts, Jujutsu, Kenjutsu, Archery, Spear, but also study literature, artillery and tactics.